Course Description: This course will teach you how to use the SOLIDWORKS Motion simulation package to study the kinematics and dynamic behavior of your SOLIDWORKS assembly models. Prerequisites: Knowledge of SOLIDWORKS and the basics of the MotionManageris required. If you are not familiar with the basics of the MotionManager, the class manager will send you a self-paced lesson that should be completed before class begins. Knowledge of basic mechanical engineering concepts is recommended. 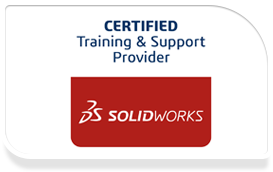 Who should attend: Designed for users who would like to become productive fast, the advanced course offers hands-on experience on the use of SOLIDWORKS Simulation Dynamics modules.